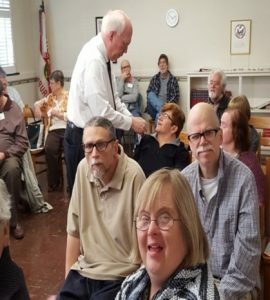 The Special Education Department of Bethel UMC was started in the fall of 1967 by two visionaries, Jack and Betty Cannon, who had a daughter, Suzanne, with intellectual and developmental disabilities. Jack was serving as the Superintendent of the Youth Division. Their son, Dr. Steve Cannon, serving with his wife Karen, are now the directors of this ministry. The program has now grown to 45 students on the roll and 12 staff who faithfully serve these students. There are still four of the original eight on the roll, each attending almost every Sunday. Our main theme is “God is Love” and that there is no such thing as a disabled soul. We follow a pretty well ingrained routine since many of our students also have been diagnosed with an Autism disorder. Several students have the ability to read, so they are in charge of reading our weekly Scripture lesson which accompanies a third-grade level Sunday school lesson. activity. Some simply desire to watch the upstairs Worship Service via closed circuit television. We welcome all adults with special needs and consider this ministry to be one of the greatest blessings of the Bethel Church family! For more information, you can contact Steve Cannon at sclawins1@bellsouth.net.